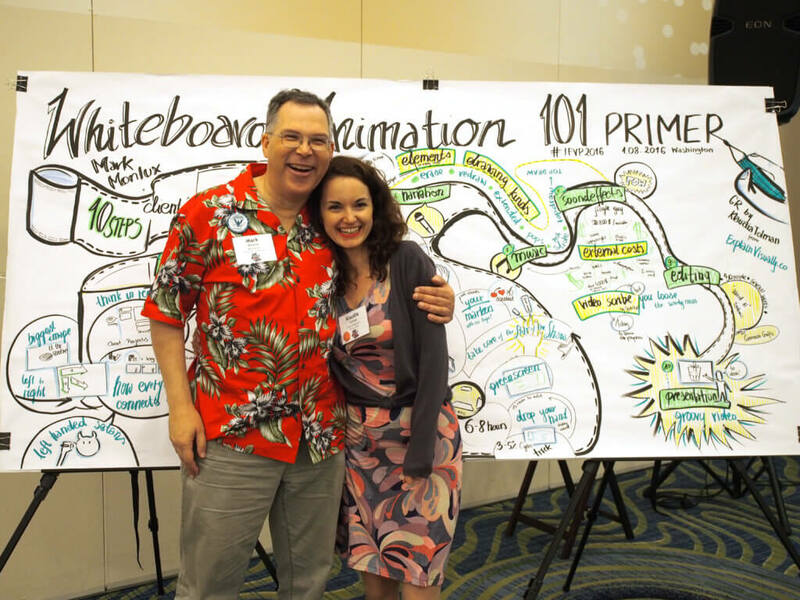 Looking for graphic recorder or graphic facilitator? What is Graphic Recording (and Graphic Facilitation)? When the lecturer starts his speech on the stage, the atmosphere of concentration fills the lecture hall. It is his name that brought the crowd to this conference. The slides complete his words, and hundreds of people are focused on him and try to remember as much as they can from the lecture. Meanwhile, there is one person in the hall who looks at something completely different. She stands on the left side of the stage, and her eyes are actually pointed at a large, illuminated paper board. In fact, she looks at the drawings that she is skilfully making at the moment. What does she do at this conference? Why do the most important corporations in the world ask for her help? And what is this all for? Enjoy your reading! What is not present at conferences? Many years ago when the first business conference began to appear in Poland, they were enthusiastically accepted. Finally, we could meet everyone from the industry in one place. Conversations over coffee encouraged the exchange of views and building business contacts. Presentations helped following the latest trends. Today, this market is highly developed. The speakers are aware that entering the stage and hurriedly read their slides is not enough. They are getting better and better as the standards are higher and higher. Thanks to the popularity of conferences such as TED or TEDx (where I also had my talk), almost everyone can see many small presentations without leaving home. And that increases the expectations of the people attending the conferences. Some people even make jokes from this showmanship. However, it cannot be denied that the lecturers today present so curious speeches that it is hard to decide whether to take notes, pictures, record everything via a smartphone or dive into their stories. And almost always there are several of them, so it is hard to remember so much information. Well, there is one more issue. Conferences are used for networking; however, not everyone feels comfortable with starting conversations with strangers (for instance, people who are timid or introverted). Here is the place for someone already mentioned standing near the stage. This person is a graphic recorder, who performs a visual recording. What does this person do? By using drawings that can be understood by everyone and essential, spare text, this person immortalises every presentation, supporting the memorisation of the most important elements. When the conference participants know that the lecturers’ presentations are being noted, they are more eager to listen to them (they do not have to stand with their legs mentally apart between taking notes and listening ;P). Because of that, they remember the presentations better, and as a consequence – the entire conference. What is more: if they have a graphic recorder within the range of their vision, they can also glance at the drawings that are being currently created, as those are the visual summary of what the lecturer is saying. Because of that, the knowledge becomes even more commemorated. In English, such type of service is usually called graphic recording. But it also go by other creative names such as scribing, graphic harvesting, graphic facilitation. Interestingly: in the USA, the name of this service often includes the prefix graphic (e.g. graphic recording, graphic harvesting, graphic facilitation etc. ), and in the United Kingdom it uses the word visual (similarly visual recording, visual harvesting, visual facilitation etc.). I most often call it: Graphic Recording and Visual Thinking. 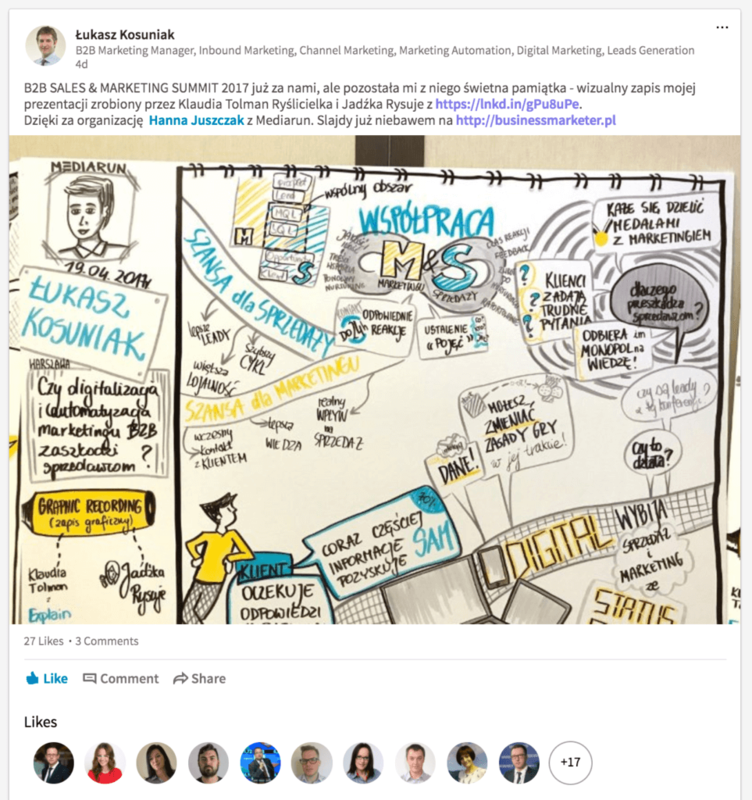 So, how does applying graphic recording really look like at a conference? During a break, the participants go out for coffee or tea and to have something to eat. Right next to the catering, there are drawing notes from the presentations, enthusiastically photographed by the participants. They are also natural excuses for starting a conversation, helping to break the ice. It is easier to start a conversation when you have a common topic. Also, the lecturers take photographs of the drawings, which make very surprising mementos for them. They often later share the boards on their LinkedIn and Facebook profiles, and they cannot be amazed enough that the board includes precisely what they were talking about during their presentation. The advantage of graphic recording is creating an image on one board. Because of it, we can see the so-called big picture, which is the full content of the presentation (or even the conference). As opposed to a sequence of several slides, it is easy to instantly grasp the full view of the discussed topic. When the conference is over, the participants receive a high quality photograph of the board. They have the summary of every presentation at their fingertips, and within a few seconds they can remember its content. It is hard to specifically indicate when drawing during events was born. David Sibbet, by members of the International Forum of Visual Practitioners organisation (which I am a member of) referred to as the ‘Father (or even Grandfather!) of visual practicing’, claims that the first graphical facilitations took place in the US back in the 1970s. Already then, it was obvious that groups work much better and think more efficiently — and its members are able to remember much more — when they have an opportunity to process the information in a visual and text manner at the same time. For a few years, a real boom for those services has been observed in Poland (where I most often work). 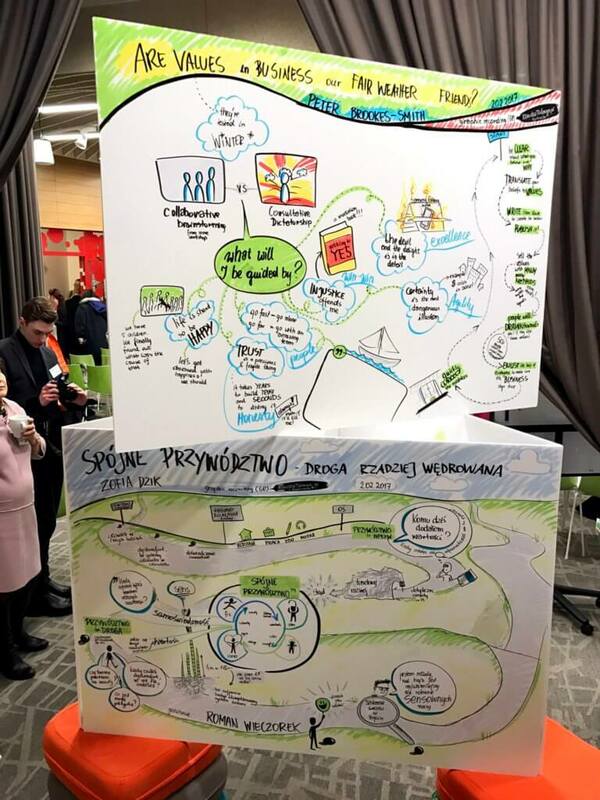 Apart from open conferences, which dozens of hundreds of people participate in, Graphic Recording is also ordered by companies for their internal use. I, myself (and I have done GR since 2013) have been carrying it out for companies such as Google, PKN Orlen, IKEA, PepsiCo, DHL, Danone, Hilti, Bank BPH and Aviva. My friends in the profession (there are less than ten of the Polish scribes who work professionally) also provide services for many known brands. 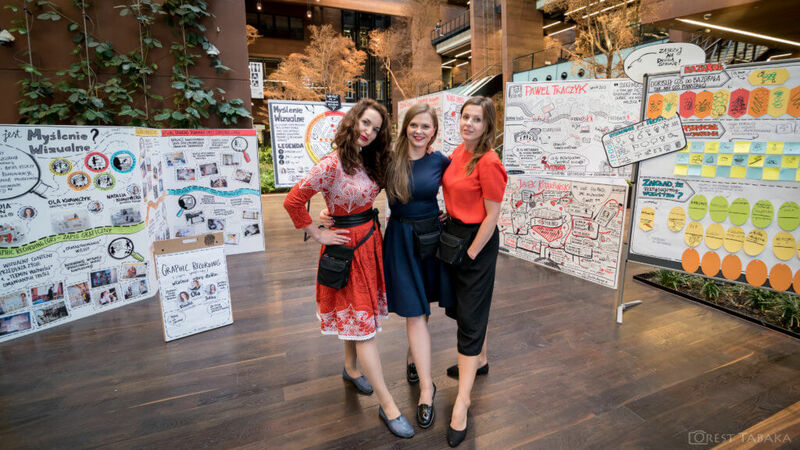 What is important: even though it has been only a few years since the boom of graphic recording and visual support events in Poland, this does not mean that it was born in our country just now. Graphic facilitation is slightly different than just recording. 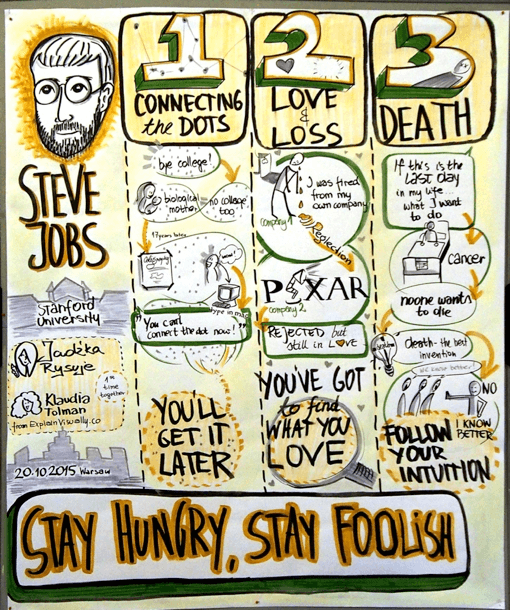 What do companies use graphic facilitation for? During strategic and project meetings, some problems return again and again. The first problem is low engagement. Not all participants are always eager to take an active part in the meetings. Sometimes because they do not see the point in doing that, is often also the result of exhaustion. A good agenda and a charismatic lecturer help with smooth transitions through all points. 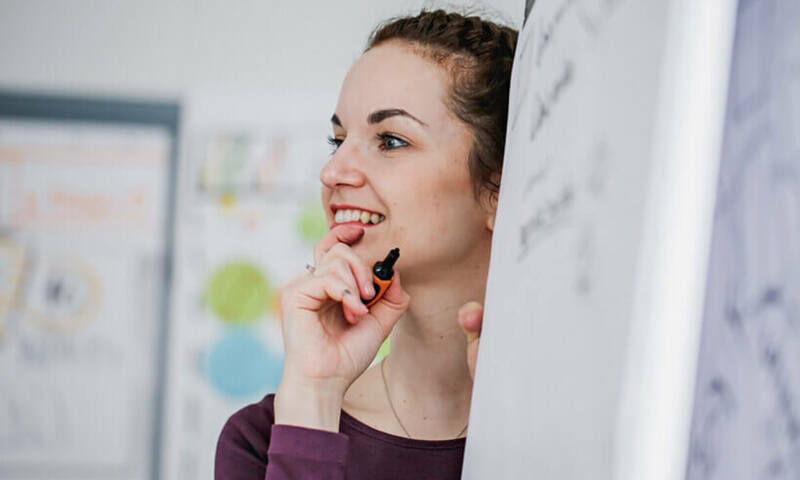 A graphic facilitator, impartially scribing all utterances, by means of which the employees have a sense of being heard and that encourages them to speak more, can be a good support for the meeting. It becomes more productive. When looking at the graphical presentation, the participants know what has already been discussed and where the discussion is heading. Additionally, it helps to stir the creativity of a team as they perceive the subject from a new, visual side. The second one is lack of communication. Those words often mean different things. For a Financial Director, the project success is something different than for a Marketing Director. Each one of us is looking through a prism of our position and the objectives connected with it. Spotting the content by a visual facilitator and translating it to visual metaphors helps to clearly show all perspectives on a particular subject. The visualisation additionally eases the understanding – as the image already symbolises a particular interpretation and direction of thoughts. If the project success is symbolised on the board with the ‘$’ sign, it would mean a financial success. A marketing director may, however, ask for adding a handshake, which represents new clients. This, in turn, may lead to further discussion in the group led by the facilitator: as, for instance, the group says: No, we do not want two hands, but a gesture of several hands, which are heating up before the fight and placed one on top of the other to prepare for shouting a motivational phrase... This allows the group to realise that those several people are together striving for financial success. The graphic recorder puts in order and summarises the whole discussion on a particular topic, and, thanks to that, the team obtains a full image of the situation. This allows them to make the best possible decision regarding a strategy, product or communication. Sometimes they ask the participants to draw something. Because of it, their involvement significantly increases, and via an unusual form of communication, the atmosphere warms up. Is graphic recording for everyone? Of course, graphic translators are not invited to all meetings. It would be ineffective in terms of costs, and it would create difficulties with setting dates in accordance with the tight schedules of graphic recorders. They usually appear at vital meetings, where the decisions made may have far-reaching consequences for the company. Then, the graphical recording of the meeting is often photographed and sent to employees. It is used as a summary of the most important points regarding a new strategy or product. And the companies, when they experience creative and productive work, become very eager to experiment some more and use the work already generated by the graphic translator: One of my clients used the photographs of the boards and created the wall calendar made of them as a present for every employee. Executed drawings (of course, as long as the contract with the graphic recorder applies) can be used to make different gadgets for employees or clients, such as printed mugs, notebooks, fridge magnets, clips or mouse pads. 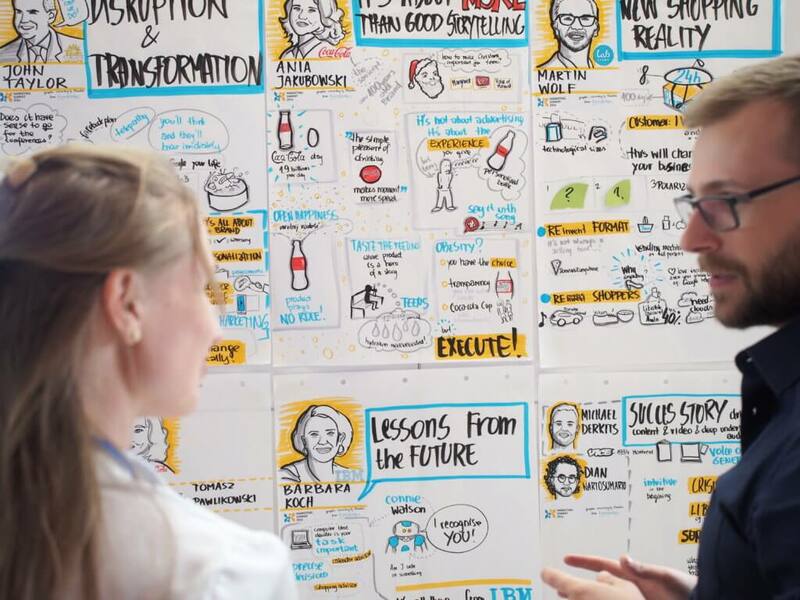 There are a lot of ways to use graphic recording – both at conferences and during meetings. The movement itself has been evolving for 40 years, and its popularity is constantly growing. It can be especially seen nowadays when every day we have lots of information to process and not enough time to do so. Professionally-made drawings help us to grasp the entire message faster and add a bit of relaxing “freshness” to serious subjects. And the drawings can be applied in many ways. Graphic recorders are usually very creative, so new ideas are often born while talking to clients. That is why we never know what the next drawing is going to bring. And that is what graphic recording is all about!